Mars Odyssey (Oct 2001, NASA, US). Its mission is to use spectrometers and a thermal imager to detect evidence of past or present water and ice, as well as study the planet's geology and radiation environment. Odyssey globally mapped the amount and distribution of many chemical elements and minerals that make up the Martian surface. Maps of hydrogen distribution led scientists to discover vast amounts of water ice in the polar regions buried just beneath the surface. Odyssey also recorded the radiation environment in low Mars orbit to determine the radiation-related risk to any future human explorers. Mars Express (Dec 2003, ESA, EU). 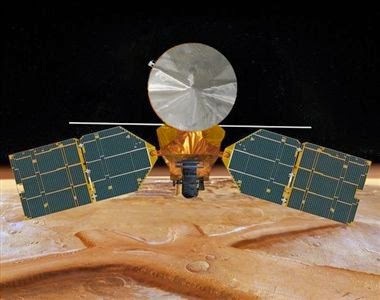 The mission originally consisted of two parts, the Mars Express Orbiter and the Beagle 2, a lander designed to perform exobiology and geochemistry research. Although the lander failed to fully deploy after it landed on the Martian surface, the orbiter has been successfully performing scientific measurements, namely, high-resolution imaging and mineralogical mapping of the surface, radar sounding of the subsurface structure down to the permafrost, precise determination of the atmospheric circulation and composition, and study of the interaction of the atmosphere with the interplanetary medium. Mars Reconnaissance Orbiter (MRO) (Mar 2006, NASA, US). One of the mission's main goals is to map the Martian landscape with its high-resolution cameras (HiRISE among other) in order to choose landing sites for surface missions. 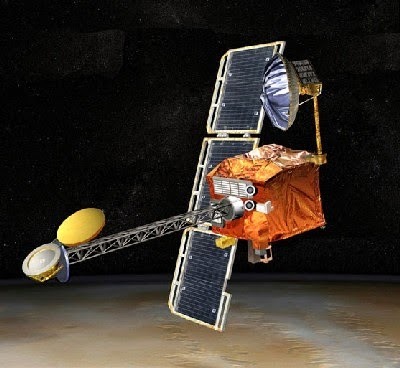 MRO is using its onboard scientific equipment to study the Martian climate, weather, atmosphere, and geology, and to search for signs of liquid water in the polar caps and underground. 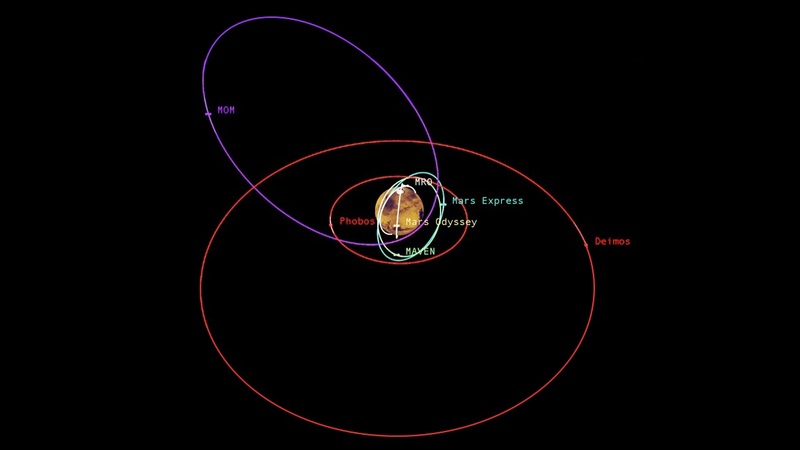 The probe's extended mission is to be the communication and navigation system for Mars landers and rover probes. MAVEN (Mars Atmosphere and Volatile Evolution) (Sep 2014, NASA, US). 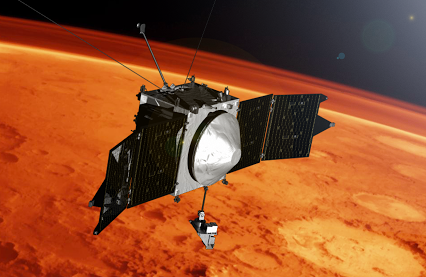 MAVEN is exploring the Red Planet’s upper atmosphere, ionosphere and their interactions with the Sun and solar wind. Mission goals include determining how the Martian atmosphere and water, presumed to have once been substantial, were lost over time. 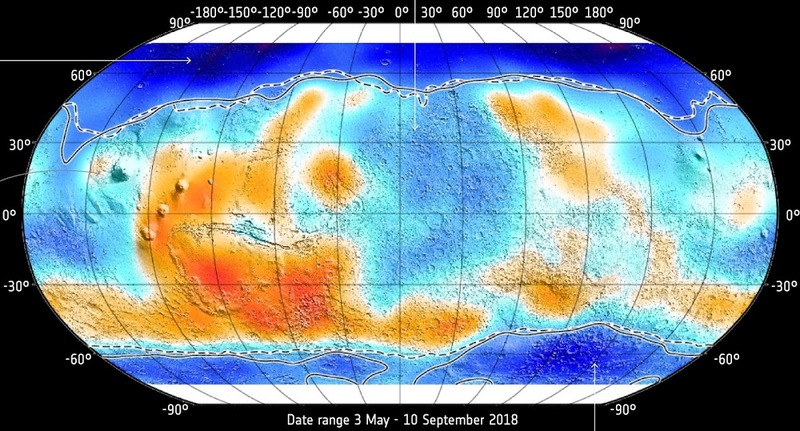 Scientists are using its data to determine the role that loss of volatiles from the Mars atmosphere to space has played through time, giving insight into the history of Mars' atmosphere and climate, liquid water, and planetary habitability. 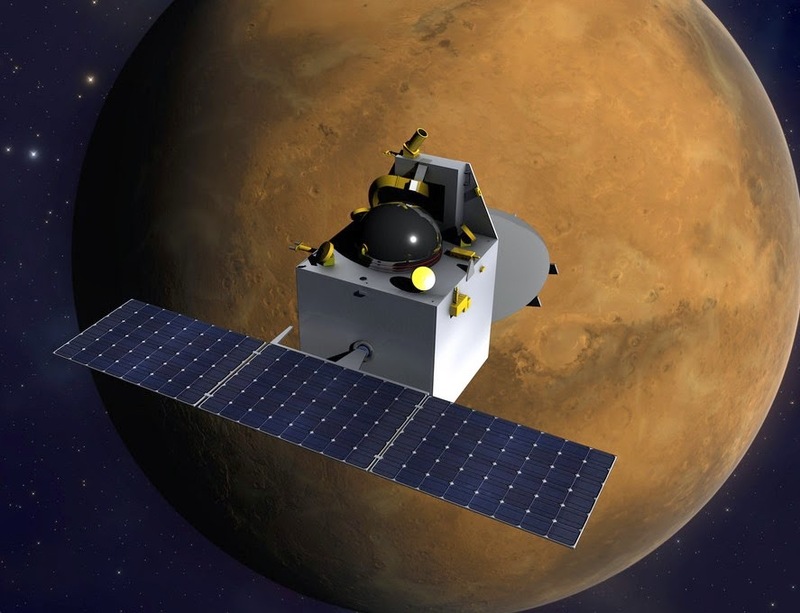 Mars Orbiter Mission (MOM or Mangalyaan) (Sep 2014, ISRO, India). 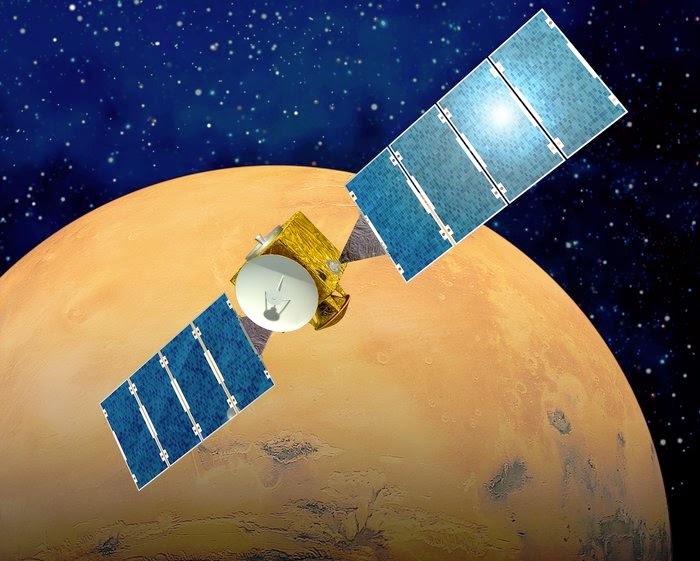 It is India's first interplanetary mission and ISRO has become the fourth space agency to successfully reach Mars. The primary objective of the MOM is to showcase India's rocket launch systems, spacecraft building and operations capabilities, specifically - to develop the technologies required for design, planning, management and operations of an interplanetary mission. The secondary objective is to explore Mars' surface features, morphology, mineralogy and Martian atmosphere using indigenous scientific instruments.